Mr. Dilley predicts that 2018 will be somewhat of a repeat of 2017 – but some hurricane landfalls will occur in different locations this year. You can expect 16 named storms, 8 hurricanes, 4 major hurricanes, potential for 4 United States hurricane landfalls – 2 of which will likely be major impact storms. And once again – some Caribbean Islands will have another dangerous season. On the average, the entire Atlantic Basin has 12 named storms, 6 hurricanes and 2.7 major hurricanes. The reason for another destructive hurricane season is 3-fold. Although ocean water temperatures have cooled across the Eastern Atlantic – the water temperatures continue to run warmer than normal from just East of the Lesser Antilles and especially in the Caribbean region and the Atlantic near the United States. This is very similar to the ocean temperatures of last year, and this will again be conducive for tropical storms and/or hurricanes forming and/or strengthening near the Lesser Antilles and close to the United States. Mr. Dilley also expects ENSO Neutral Conditions (no El Nino) that are conducive for active seasons, and the Bermuda-Azores High Pressure Center will again be in a favorable location – thus allowing more named storms to strengthen as they move east into Caribbean region and toward the United States. Georgia homeowners might be a little less prepared for hurricanes if 2018 turns out to be a stormy year. The state of Georgia’s rating from the Insurance Institute for Business and Home Safety for residential building code systems slipped a point from the last rating three years ago. Of 18 states that are considered to be “hurricane-prone,” the IBHS ranked Georgia No. 11 in terms of safety with a score of 68 out of 100. Georgia was rated 69 in 2015. The IBHS assessed several factors in compiling the ratings, such as code adoption and enforcement, building official training and certification, and licensing requirements for construction trades who implement building code provisions. Florida’s residential building code systems ranked as No. 1 among “hurricane-prone” states on the list with a score of 95 out of 100. Coral Park High School won first place with their impressive wind resistance model building. Students from Florida Christian School set up their model building in front of FIU’s Wall of Wind fans. 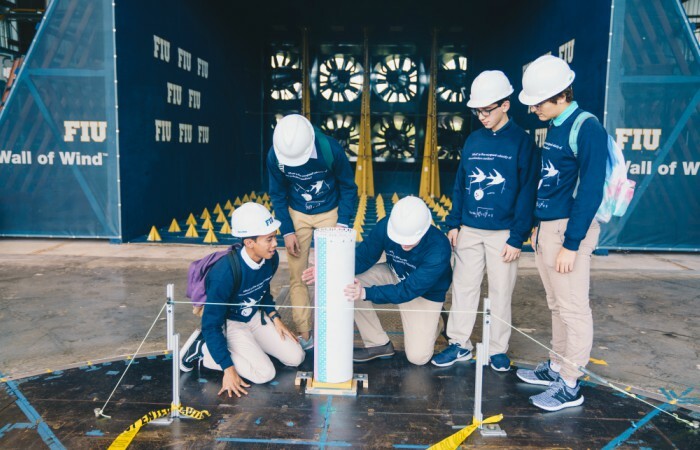 Eight students from Coral Park Senior High School huddled together, a question hanging in the air: Would the model building they created withstand 50 mph winds produced by FIU’s Wall of Wind (WoW)? 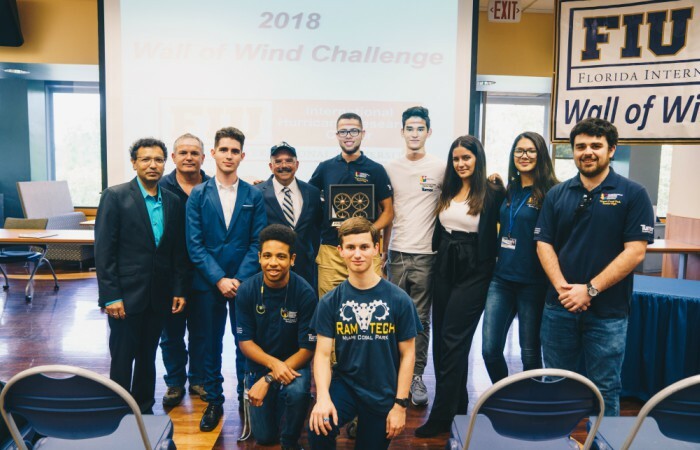 Each year, the WoW Challenge invites local high school students to build scale model structures that test their engineering skills against the WoW – a hurricane research facility at FIU’s Engineering Center with fans capable of generating 150-mph winds and category five hurricane conditions. The WoW is one of eight Natural Hazards Engineering Research Infrastructure (NHERI) Experimental Facilities nationwide, designated by the National Science Foundation (NSF) to research the impacts of earthquake, wind and water hazards. WoW’s research focuses on wind effects on infrastructure and how to prevent these wind events from becoming community disasters. The WoW Challenge is hosted by the International Hurricane Research Center – housed within FIU’s Extreme Events Institute – and is supported by a grant from the Florida Division of Emergency Management. This year’s challenge was to create an aerodynamic building model at least 32 inches high and 8 inches wide that could withstand winds of 50 mph or higher. Students also completed a technical paper and an oral presentation about their design. Six schools participated in the competition. Coral Park students built a 40-pound cylinder-shaped structure made of cardboard and solid materials. It was the only model in the competition that sustained winds of a category one hurricane (at least 74 mph) – earning the team first place, with a ten-point lead over the second-highest placing team. The students from Coral Park Senior High School earned first place with their impressive model building. The Florida Christian School team – who won second place — designed a blue, pink and white colored tower made of cardboard and plastic. They named the structure Katy Perry. According to several students, every time they would see “her” wobble while conducting wind resistance tests, they would go “ah—ah—ah” like in Perry’s song “Firework.” The name stuck. So did the desire to become an engineer. The competition also helped aspiring engineers, like Coral Park senior Sergio Echevarria, learn about new career paths and appreciate different areas within engineering. Wind engineering estimates the effects of winds in the natural and built environment – and how structures test against strong winds. “The whole purpose of this kind of thing is to bring young people in to learn about wind engineering,” said Arindam Chowdhury, director of the Laboratory for Wind Engineering Research and professor in the Department of Civil and Environmental Engineering, part of the College of Engineering and Computing. “The Wall of Wind Challenge is how we get the next generation of scientists and engineers involved,” said Richard Olson, director of the Extreme Events Institute and professor in the Department of Politics and International Relations, which is housed in the Steven J. Green School of International and Public Affairs. Olson said he often meets FIU students researching how to mitigate hazards or studying engineering, and they remember they got interested in the topic as high school students attending the WoW Challenge. The top three teams – Coral Park, Florida Christian and Booker T. Washington High School – received cash prizes and a one-of-a-kind trophy, featuring bronze wind turbines inside a framed case. “This [experience] is something they will remember for the rest of their lives,” said Erik Salna, associate director of the International Hurricane Research Center. As hurricane season begins, an MIT expert discusses the benefits of building structures that can more easily weather a major storm. A new study on the resale value of FORTIFIED home construction by The University of Alabama’s Center for Insurance Information and Research, ACIIR, can be found at the URL below. CEO / President of Disaster-Smart Consulting, Inc., Darius Grimes, sits on the advisory board of this organization. This article was written by the Wall Street Journal about IBHS and their Fortified Program. IBHS digitally secured the rights to this article and it can be accessed through their website at https://disastersafety.org/. home from both destructive summer storms and hurricanes. Contact our office today! Hurricanes dominate headlines more often during the summer and fall than thunderstorms and lightning, but the South Carolina-based Insurance Institute for Business & Home Safety Research Center cautions homeowners not to underestimate the destructive and deadly force of summer storms. Thunderstorms occur more often and have a direct impact on more people and homes in the U.S. than hurricanes. And, according to the National Weather Service, every thunderstorm produces lightning. The IBHS says a whole-house or -building surge protector is the best starting point for reducing the risk of lightning damage, along with localized surge protectors for power cords of electronic equipment and telephone and cable or satellite television lines. To reduce the risk of storm damage to your home, it’s important to prepare your surroundings by replacing gravel or rock landscaping materials with softer materials, such as mulch; trimming trees and shrubbery away from structures; and removing weakened sections of trees. If a storm is imminent, the IBHS recommends limiting sources of windborne debris by securing or removing lawn furniture, planters, bird feeders and decorative objects. Seal openings, cracks and holes on the outside of your home to protect your home’s openings from wind-driven water. Fill holes where wires, cables and pipes enter and exit the home, and seal around electrical boxes and circuit breaker panels. Seal cracks around wall outlets, dryer vents, bathroom and kitchen vents and wall lights. Also, check your garage door. If it doesn’t have a pressure rating sticker, have it evaluated. If necessary, have a bracing system installed to prevent wind from blowing in the door. Strengthen the roof by ensuring the roof sheathing is strongly fastened to the roof frame, and seal the roof deck to minimize water getting into the attic should the roof blow off. Use roofing cement to re-attach any loose shingles. For more tips on protecting your home against storm damage, visit disastersafety.org/thunderstorms. to schedule your home evaluation today. Natural disasters are going to happen. Take steps to prepare—and see if you can get help with the costs. Last year was one of the worst on record for natural disasters in the U.S., with more than $300 billion in property damage. Some 16 separate weather-related events were responsible for losses of more than $1 billion each. The most-expensive damages were from hurricanes—notably Harvey, Maria and Irma—but other types of perils broke records, too, including California wildfires, Colorado hailstorms, and tornadoes in the Midwest and Southeast. Last year was also the warmest on record. With a warming climate, the weather is becoming more volatile and extreme events more frequent. You can reduce the risk of costly damages by strengthening your home against the destructive forces most likely to affect your area of the country. By doing so, you’ll increase the likelihood that your home will survive the worst that nature throws at it. And depending on your state, municipality and insurer, you may qualify for grants or insurance-premium discounts to offset part of the cost. To protect your home from hurricanes, you need to seal all openings from wind and rain. “When there’s an opening, the wind enters and acts as a balloon, pushing and pulling so the building comes apart,” says Julie Rochman, president and CEO of the Insurance Institute for Business and Home Safety (IBHS). The best time to add protection to an existing home is when you replace the roof. A few inexpensive upgrades can make a big difference. The IBHS’s Fortified standards (which earn a discount from many insurers) focus on three layers of protection for the roof. The bottom layer—the plywood roof deck—is held on by special “ring shank” nails. The next layer seals the roof deck with a membrane or special tape. Properly sealed storm-resistant shingles form the top layer. Installing flashing anywhere the roof changes slope also helps. It’s also important to seal and reinforce your windows and doors. You can protect your windows with storm shutters, 5/8-inch plywood or thick plastic shields. Or you can install replacement windows with impact-resistant glass. “Every opening on your home needs to have one of those levels of protection,” says Scott Koedel, CEO of Don Meyler Inspections, which conducts windstorm mitigation inspections in Florida. Look for wind-rated and impact-tested doors, and be particularly careful with your garage door, which is often the largest and weakest opening. Even if you aren’t replacing the garage door, you can buy a kit to brace it. Also check all exterior door frames to make sure the screws are tight and the deadbolt reaches all the way into the door frame. Help with the costs. You may get an insurance discount or state grant for wind-mitigation improvements. In Florida, where discounts are mandated for certain improvements, home insurance premiums can vary by 400% depending on the windstorm protections, says Chris Heidrick, an independent insurance agent in Sanibel, Fla. He recommends paying about $100 to $250 for a windstorm inspection to find out what you can do to protect your home and get a discount, even if you don’t live near the coast. In other states, the discounts vary by insurer. Chubb clients in some areas can save up to 50% off their home insurance premiums by installing wind-mitigation features, such as storm shutters, wind-resistant roofs and tie-downs, and a permanent home generator. In some states, USAA, Farmers and Travelers offer discounts for homes that meet the IBHS Fortified standards or for adding certain features, such as storm shutters. Some states have grant programs to help cover wind-mitigation costs. For example, Alabama and South Carolina provide grants to strengthen roofs in some areas. Ask your state insurance department or emergency management agency about programs. Severe thunderstorms associated with tornadoes, hail and high winds occur in all 50 states, but they’re most common east of the Rockies. Even when the most intense tornadoes strike, the area of strongest winds and greatest damage is typically highly localized. If your home is to the side of the tornado’s path, the same techniques used in hurricane-prone regions will help your home survive. For instance, making sure that the roof is strongly connected to the walls, and the walls to the foundation, will help keep the building intact. When replacing existing windows or patio doors, install ones with impact-resistant glass. In the event of a direct hit, a safe room saves lives. Check with your state’s office of emergency management regarding rebates for adding a storm shelter. For example, in Oklahoma, homeowners (chosen by lottery) will be reimbursed for up to 75% of their cost, up to a limit of $2,000. Insurers in Oklahoma must provide a premium discount or rate reduction to homeowners whose homes meet the Fortified standard for high wind and hail. To protect against hail, your best defense is an impact-resistant roof. Hail can dent and tear roof coverings, which can lead to water damage inside your home. When you reshingle your roof, ask the roofing contractor to remove the old shingles and underlayment, replace damaged sections of the roof deck, re-nail the deck to the roof framing, seal the seams, and apply new underlayment. Spring for an impact-resistant (IR) roofing material rated Class 3 or 4 by Underwriters Laboratories. (Most slate, metal and tile products also meet that standard.) The price per bundle will run $40 to $80, compared with $15 to $30 for a basic asphalt shingle. A Class 4 roof may last 30 years. Your insurer is likely to give you a discount on your premium. For example, in 26 states, State Farm offers a discount of up to 35% to owners with qualifying roofs. While California waits for the big one, other parts of the country are at risk, too, including states adjacent to the Mississippi, Ohio and Wabash river valleys in the central U.S., as well as Charleston, S.C., and areas of Oklahoma and Pennsylvania where there is oil and gas drilling. How well your home holds up in an earthquake will be partly determined by when it was built and the building codes at the time. Wood-frame homes built before the mid 1970s may have a short “cripple” wall between the foundation and the floor of the house, creating a crawl space. During an earthquake, cripple walls can collapse. The most common earthquake retrofit braces the cripple walls with plywood and bolts the house to its foundation. Even a house without cripple walls may benefit from bolting. Check with your city to see if it has a standard retrofit plan ready for permitting. Look for a licensed, insured contractor with seismic retrofit training from the Federal Emergency Management Agency. The California Earthquake Authority, which provides earthquake insurance for Californians, says a brace-and-bolt retrofit typically costs between $3,000 and $7,000. In certain high-risk zip codes, the CEA offers a rebate of up to $3,000 to homeowners who have completed the retrofit. In certain situations (for example, if your home is built on a hillside, has living space over a garage or has unreinforced masonry), a seismic retrofit will require an engineered plan and will cost tens of thousands of dollars. In that case, earthquake insurance may be the most cost-effective way to protect yourself from financial devastation, says Janiele Maffei, chief mitigation officer with the CEA. Homeowners insurance doesn’t cover earthquake damage, but a standard policy covers fire and the cost to live elsewhere temporarily. Although retrofitting increases the odds that your home will survive an earthquake, there are no guarantees. If you can’t afford to cover the loss of your home and belongings out of pocket, it pays to have earthquake insurance, which you can buy as an endorsement to your homeowners policy or as a separate policy. The cost varies depending on the risk. For example, a policy for a home insured for a replacement value of about $600,000, with a 5% deductible and $200,000 of personal property coverage, would cost $561 a year in Sacramento but $3,695 in San Jose. At least one-third of homes in the U.S. sit in a “wildland-urban interface,” where development meets a natural environment and wildfire is a serious risk, according to the U.S. Forest Service. The first step in protecting your home is to create a “defensible space” around your house so a wildfire can’t reach it, says Steve Quarles, the chief scientist for wildfire and durability at IBHS. That means managing plants and trees so they’re less likely to ignite or, if they do, so the flames won’t reach your home or burn hot enough to ignite siding or break the glass in the windows. Within 5 feet of your home and under an attached deck, replace bark mulch with gravel or brick or concrete features. Next, make your house resistant to windblown embers. For the best protection, your roof should have a covering rated Class A—commonly, composition shingles made of asphalt and fiberglass, or a covering made of steel or copper, or tiles made of concrete or clay. If you have a wood-shake roof but no documentation that it is treated with fire retardant or has an underlying fire-barrier material, replace it. Block the open ends of clay-barrel tile, and protect the edge of the roof with noncombustible gutter covers and a metal drip edge. Embers that enter the house through attic and eave vents can start fires that will likely “take the house to the ground,” says Quarles. Cover vents with metal mesh that has openings no bigger than an eighth of an inch. USAA offers about a 5% discount to members in seven states who live in a Firewise community. Some 1,400 communities participate in the National Fire Protection Association’s Firewise USA program, which encourages neighbors to work together to prevent losses. Find participating communities with their interactive map. Contact your local fire department to see if it will inspect your property for fire resistance. If your home is insured by AIG’s Private Client Group, Chubb, PURE or USAA, you may be eligible to enroll in a wildfire defense program at no cost. Available mostly in western states, these programs provide at-home consultations, monitoring and last-minute preparations. TAMPA, Fla.–(BUSINESS WIRE)–The Insurance Institute for Business & Home Safety (IBHS) today released the new edition of its preeminent report on the residential building code systems in 18 hurricane-prone states. The 2018 edition of Rating the States follows a disastrous year of storms in 2017, and is well timed to inform discussion and action to improve building strength as communities repair or replace homes damaged by hurricanes last year. According to Disaster-Smart’s CEO “All of our aerial photography and video is taken by DSCI inspectors who have obtained the required Commercial FAA License. DSCI is in full compliance with FAA regulations and can file flight plans to take aerial photos for commercial use even in restricted flight space.” Avoid potential liability and make sure the company you use is in full compliance with the FAA Rules and Regulations to avoid fines and penalties associated with listings for the sale of property. According to recent stories “Realtors and other commercial drone operators “are subject to all existing FAA regulations, as well as future rule-making action,” the FAA said.